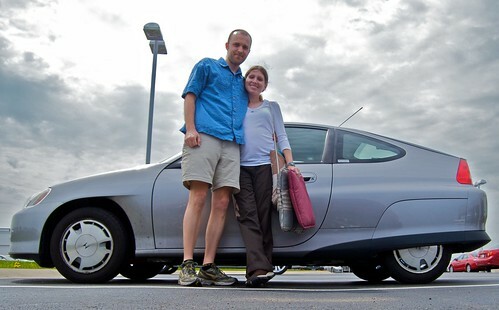 For some time, Rob and I have known we would have to get rid of Iris, our beloved Honda Insight. We got the car in 2002 and have been getting close to 60 miles per gallon ever since. There have been some times when it has been a bit complicated that our only vehicle is a 2-seater hatchback with no back seat, but we always worked around it. Now that Fig is on the way, we had to come up with a mode of transportation that would accommodate all 3 of us. 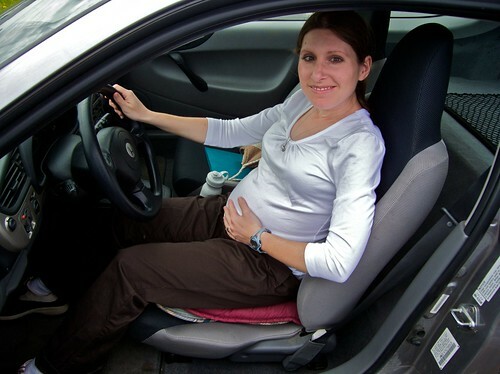 While I had my hands full with researching things like doulas, cloth diapers, vaccinations, and hypnobirthing, Rob took the bull by the horns and researched our car options. He determined that our current best bet would be a Prius. At first, we thought we’d have no problem selling Iris on our own. Over the years, numerous people—ranging from friends, family, to complete strangers—have expressed interested in buying Iris should we ever decide to sell. Iris’ popularity was at its height back when gas was at $4 a gallon. But alas, gas is too damn cheap now. Rob placed at least 3 different ads, but we had less than a handful of takers and no one who was seriously interested. I wanted to wait until the summer, when gas prices are sure to climb again, and people become less fearful of the idea of a 2-seater car when they are faced with the sting at the pump. But my desire to wait it out was also partially motivated by the fact that I really didn’t want to let go of Iris! We ended up taking the plunge this weekend. A few months ago, we had headed to O’Brien Auto Park and test driven a Prius. Rob had loved it (the only other times I’d ever seen him so excited was when he got a new bike), but I was at the height of the whole hyperemesis gravidarum thing, and was just trying to get through the ride without vomiting all over the brand new car we were merely looking at and did not intend on buying that day. Well yesterday we went back to O’Brien to seal the deal. I’ve got to say, it was an overall truly pleasant experience. I feel like we were treated very fairly, and the salesperson who worked with us was really friendly and helpful. The whole thing took forever (over 4 hours), but that was only because they were so thorough. They gave us a full-on tutorial of how to use all the crazy features (we chose the model with the built in navigation system). By the end, I had gone way too long without eating, which was good in a way, because I knew if I threw up in the new car, at least it wouldn’t make too much of a mess. We traded in Iris, and while I do feel like we got a fairly reasonable price, it was very sad to drive out of the lot and leave her behind, knowing we would never see her again. I am actually carrying twins that were due yesterday. But see? From the front, I don't even look pregnant! But drive away we did, in a shiny brand new Prius. We ended up going with a black car, which wasn’t the first color choice (or even second) for either of us. Rob and I had agreed that we both liked the red model the best, and I even had a name already picked out for it (Ruby). When we got there, they no longer had any red cars with the features we (i.e., Rob) wanted. Our options were to go with what they had (black and seafoam green) or special order the color of our choosing. In the end, we decided that it wasn’t worth the hassle and expense of holding out for the red car. After initially feeling a bit disappointed, I realized that the black car did look pretty sharp and snazzy, and that I would probably learn to live with it. Besides, my main hesitation with the black car was far from practical. I wasn’t worried about the way it would show salt from the roads this winter (though I am worried about that now). No, I was worried about what we would name it. At any rate, the Prius-with-no-name drives like a dream. For my inaugural trip, I went to the grocery store to get more soymilk. It was amazing. After driving such a tiny car for 7 years, it does kind of feel like the Prius-with-no-name is some kind of gigantic armored tank, but I suppose I’ll get used to it. It is definitely weird to have a backseat and a trunk again. So if anybody has any name suggestions, please let me know. I’m kicking around a few ideas, but nothing has seemed to stick just yet. Thanks for reading! The Prius With No Name. And do you see those daffodils and tulips? Those came from bulbs marked "Irises." I am doing a little forward thinking here, and I think you might consider the fact that you may not always be a one car family. Let's assume you might purchase another vehicle down the road and it might be white. So, I'm voting for "ebony"/"ivory", OR "ying"/"yang". Or, you could really get creative and and use Fig in the name - Figota! Love your new ride! Love the new car! I remember how sad Mark was to lose his Big White truck when we were getting ready for Logan's arrival. 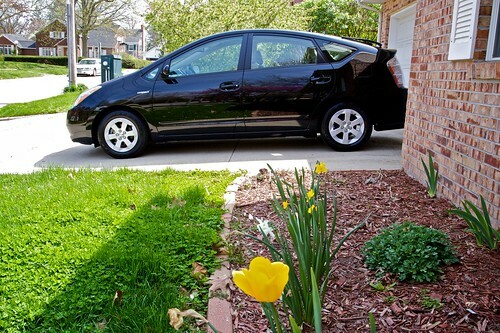 I vote for Onyx or Percy Prius!